Ever since I started this blog, I've been getting much less sleep. Not because I'm stressed or worried, but because my only opportunity to write is at night after the kids are in bed. I get Graham dressed, allow him his one allotted drink of milk before bed, brush his teeth and begin our requisite nighttime snuggle. Cael is a different animal altogether. Something in the weasel family, I'm guessing. 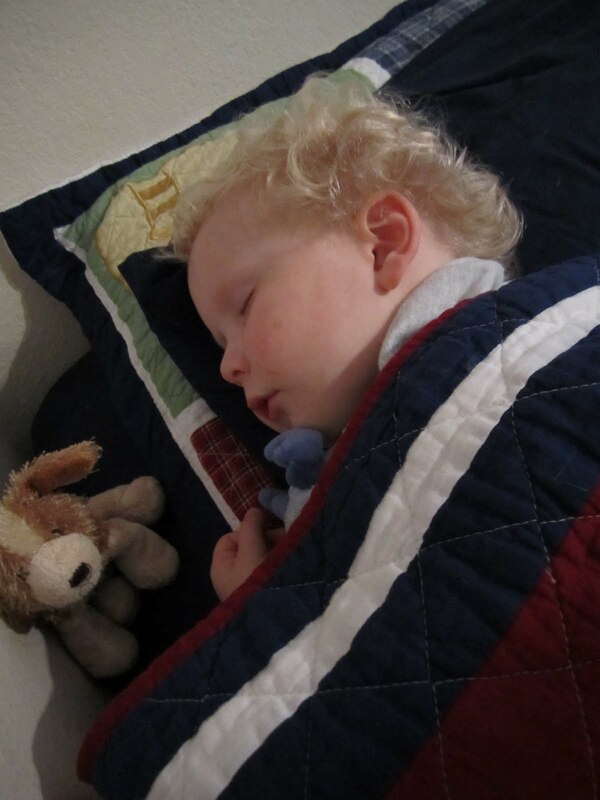 Putting him to bed is easy as he's completely willing to go, but each of the steps become individual battles that comprise the "war" that is bedtime. Once they're both stashed away, and after I've finished whatever fun activities I had planned for myself, like laundry or dishes, I settle into my computer chair to write the next day's post. That frequently turns into a marathon computer session (as evident by my pasty summer skin and increasing waistline) that can take several hours away from my already limited sleep. It would take much less time if I wasn't constantly distracted by the trinity-- the Internet trinity, that is: Yahoo, Facebook and Pinterest, but what is life without pinning pictures of stuff I want but will never have? So last night, after working for three hours and having only two good paragraphs to show for it, I gave up and went to bed, knowing that today would have to be an off-the-cuff writing day. I thought to myself that it would be good if something interesting happened this morning so that I would have material for today's post. (Not to worry, I've sufficiently beaten myself up about this.) A quick soak in the tub and a bit of an episode of Hoarders later, I was asleep. Oh, regret. I was so tired and SO deeply asleep that I was having a hard time even talking to him. "I want to watch Thomas!" (In the mornings, Cael wakes up and watches Thomas the Train on Netflix so that the rest of us don't have to be up at a quarter to six). "Is the tv not working?" "No, and I want to watch Thomas!" "...But MOMMY! The tv isn't working!! Logically I knew I had to get up and deal with the situation, but my body, which so desperately needed sleep, tried to talk me out of it. How bad could it be if I let him roam around by himself? Unfortunately, I know how bad it can be. I'm still airing out the laundry room. Sitting on the couch in the family room, I tried to coerce the tv into cooperation. But with just one small light on to see in the dark, I was having trouble pushing the right buttons. Do I need AV1? HDMI? What was it exactly? But wait... In the dark? Looking at the clock with a sense of dread normally reserved for blowout diapers and camping trips, I saw the time... 2:14am. I'd been asleep for 47 minutes. And back to bed we went. I put Cael back into his bed with a reminder that he was not to leave until the sun was up. He promised that he would sleep, and with a kiss I left his room and climbed back into my gigantic bed. "Cael! What are you doing? It's still dark out!" I put on my glasses and with trepidation, looked at my alarm clock. 3:42am. Only another 65 minutes since I fell asleep after our last rendezvous. "There's a bug in the bathroom!" "There probably is. I'll take care of it in the morning, okay? Just go potty and go to bed." "But there are bugs ALL OVER MY ROOM, too!" With mounting impatience, I grabbed his hand and marched him back to his room to show him that there were no bugs. I almost hoped there were bugs everywhere, because then at least there would be an explanation for his ridiculous sleeplessness. Turning on the light, I could see that he had emptied all of the shirts from the third drawer of his dresser. "What on earth are you doing? It's the middle of the night!! Did you ever go back to sleep?" "No, I was looking for the bugs." "Mommy! Why are you here, Mommy?!" "You're in my bed. You have your own bed. Go to bed. I need to sleep!" If it was anyone else's kid, there was a good chance I would have kicked the little creep out of bed. But, pushing my overwhelming irritation aside, I climbed the stairs and shimmied under the covers. Before removing my glasses, I glanced at the alarm clock. 4:58. Only one hour left. Lying in bed, trying to calculate the highest non-lethal dose of Bendryl one can give a child, I thought about how I would possibly function with my boys plus another to watch today. I was dreading that 6:06am alarm that would signal the end to my oh-so-restful slumber. As I frequently do, I tossed and turned, worrying so much about my lack of sleep that it caused, well, a lack of sleep. I saw 5:10, 5:32, 5:49 and, when I watched my clock strike 6:06, I flinched in anticipation of the alarm. But nothing happened. It's Wednesday, and no one is coming. I'm free to "sleep" in. I'm also an idiot. I literally smacked myself upside the head and rolled back over, with the covers tight under my chin. At least I would get a few more minutes before that little imp would disturb me again. Oh, Natasha! I feel your pain. You're working enough for several people! I hope they all let you sleep some more soon. Before the baby, that is. After that, I'll be praying for you!